Jo’s Monday walk : Todos a Caminhar! Something a bit different this week. 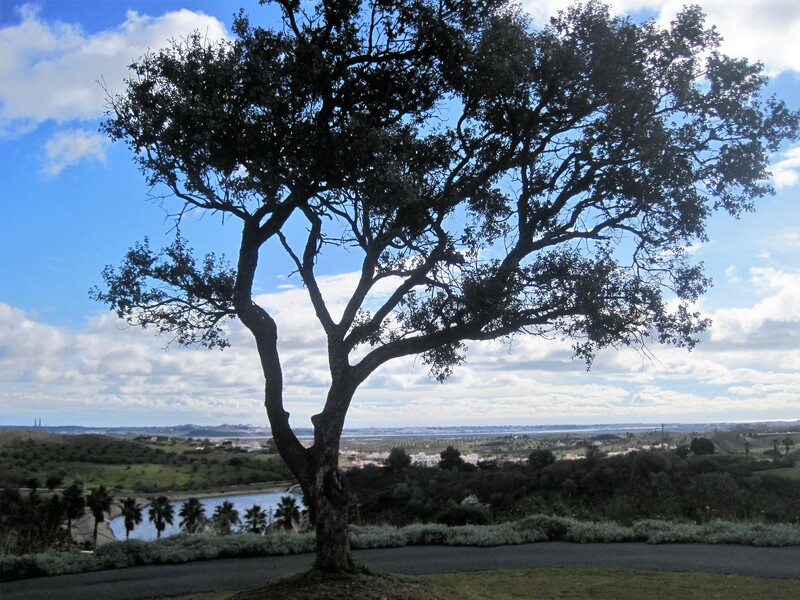 We’ve often remarked that we seldom see Portuguese people out walking, as we stride around the countryside. Maybe they don’t regard it as a leisure pastime, or are simply too busy earning a living and looking after their families. It obviously hasn’t gone unnoticed because, a few months ago, we came across an initiative called ‘Todos a caminhar’- walking for everyone! Sponsored by local councils, it aims at promoting better health in the community. 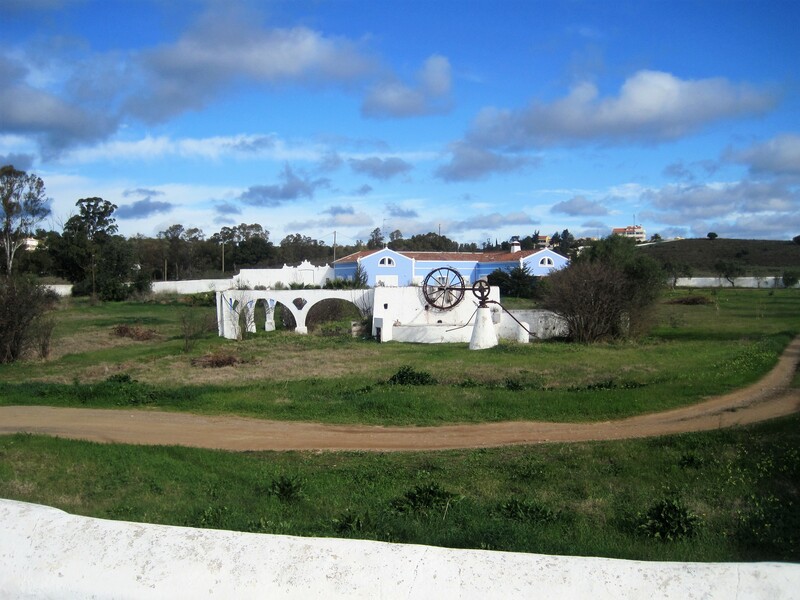 Each Sunday morning, at 10.00, a different venue across the Algarve hosts the walk. 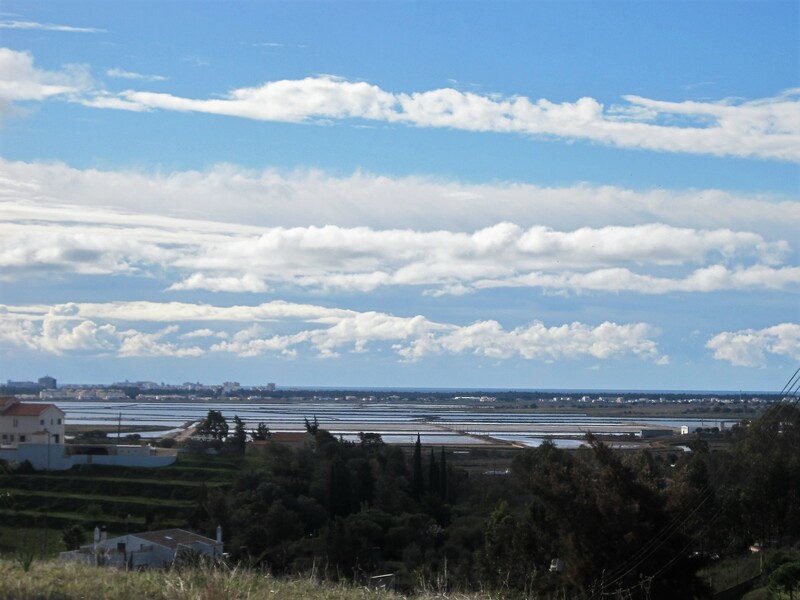 A couple of Sundays ago we turned up for the one at Castro Marim, a beautiful village right by the River Guadiana. I had visions of tramping through the salt pans with flamingos wings beating the air all around me, but it was not to be. Coaches had arrived from all across the Algarve and, there in front of the sports pavilion, a sea of people did variations on a ‘warm up’. Unphased, we joined them, and off we all surged, on the road out of the village, but nowhere near the salt pans. Almost immediately we were in open countryside, in an area unfamiliar to us, and surrounded by chattering groups of Portuguese. Determined older ladies and their gents, who were keen to show they still had what it takes, groups of giggling teens, singles striding away, everyone using up those calories so they could enjoy a really good, late Sunday lunch. It was a blustery day, with rain threatened, the scudding clouds encouraging us to pick up the pace. The group was well spread by now and we were keen not to be last. There were arrows marking every junction and cheerful helpers riding back and forth, ensuring no-one had come to grief. After another steep climb, with views of the salt pans, there was a second opportunity for water and an orange. A couple of horses, probably bored with the sparse grazing, took an interest in us motley passersby. The route climbed through the village of Monte Francisco, a few characterful older properties and a sequence of mostly new villas. Locals nodded a polite ‘Bom dia’. 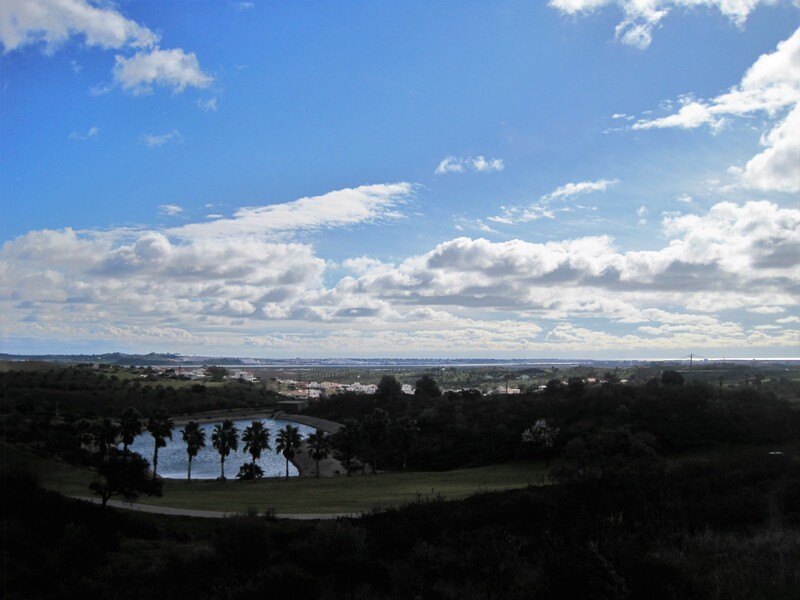 The best views of all were afforded to the Castro Marim Country Golf Club, a swish establishment with as extensive and beautifully laid out golf links as any I’ve seen. However, nothing surpassed my first sighting this year of a cistus in flower. Smiling down the home strait, the blossom twirling in the breeze, I enjoyed the placid cows and the ruin. Soon we’d come full circle, and finally I sighted my first flamingo. And where there’s one, there’s often another, isn’t there? Not quite as I’d hoped. It took us about an hour and a half to complete the 10km. We marvelled at the scale of the operation. Not all are as big as this one. There were ambulances on hand, in case anyone over exerted themselves, and everywhere, smiling, happy faces. Best of all, the rain held off, the clouds blew away and afterwards we treated ourselves to delicious tapas on a lovely sunny corner in nearby Vila Real de S. Antonio. Life could surely be worse! So much variety, here in the Algarve! I hope you enjoy sharing it with me. Come back next week because I have something rather wonderful to share. Meantime, thank you very much for your company, and if you have a walk you’d like to share with me, please feel free. Details, as always, are on my Jo’s Monday walk page. Please do visit as many of these walks as you can. Still shivering with Irene in the Midwest! And heavens, Janet almost disappears in the snow! How about some warming stew with Jackie? My good Danish friend is giving us an easy option this week. Thanks so much, Drake! But Cathy doesn’t know the meaning of easy. Go along with her and Mike, and just enjoy yourself! This one won’t take long. You have to love Tobias’ sense of humour! Thanks again to you all for spending time with me. I have another busy, but sometimes lazy, Algarve week ahead. Take good care! Thanks, Jack. 🙂 🙂 I needed a smile this morning. Oh, heavens! Must have been a real shock to the system, Rosemay. 😦 It’s turned wet and windy here the past couple of days but still a fair bit of sunshine. I hope to do one last walk with the group tomorrow morning then it’s homeward bound. Another beautiful walk Jo 🙂 Did you even notice how far you had walked when there was such beauty all around you? Sounds like a good turnout for this initiative Jo. And some lovely views even if it wasn’t quite the route you anticipated! I’m planning to join you virtually with a walk tomorrow. She is doing pretty well Jo. Walking with a walker just for safety and no limo two weeks post op from a new hip. Quite the girl she is.